The popular disc jockey, Disc Jockey James Busch of More FM, is in trouble with the law tonight. 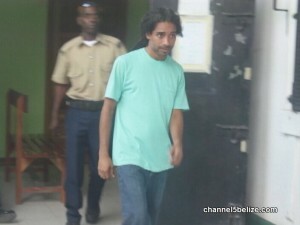 After two weeks of hospitalization, thirty-four year old Marlon Geovanni Chavez has made an official report to the Belize Police Department requesting court action against Busch, for what he says was a near death ordeal. This morning, Busch was escorted to the Belize City Magistrate’s Court in cuffs and arraigned before Magistrate Deborah Rogers for a single charge of dangerous harm. Allegations are that on January twenty-nine, 2016, he intentionally and unlawful caused harm to Chavez while he was socializing at a wake for Ian Blair on Gentle Avenue. Busch became intoxicated and violent towards him and beat him up for no reason. He reportedly punched Chavez several times then beat him to the ground until he went unconscious. Busch told the court that “The charge said I intentionally caused harm to him, but it was not intentional. It was a simple fight between two friends. We were just fighting. It was not intentional. I just got the better part of the fight.” Magistrate Rogers granted Busch bail in the sum of six thousand dollars and imposed strict conditions in which he was ordered to stay one hundred yards away from the witnesses and any of the prosecution witnesses and he must also report to the Ladyville Police Station once a week. Magistrate Rogers offered Busch a bail of six thousand dollars plus one surety of the same, which he met. He is due back in Court on April twenty-second, 2016. A CT-scan showed Chavez sustained eight fractures and four of his teeth were missing. He cannot eat well and will need nine thousand dollars for an overall facial surgery. If any one wishes to assist Chavez with his medical expenses he can be reached at 632-6418 or home number, 203-4116. He has a future on cabinet! Are B.T.L. Employees Dissatisfied with Executive Chairman Anwar Barrow? CARICOM Development Fund: What Does It Means for Belize? Will Elderly Honduran Woman Serve Time for Human Trafficking?